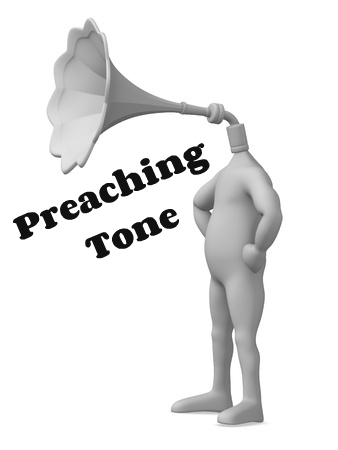 I’d like to point our thoughts to the issue of tone in preaching. Not just our tone, but also the tone of the text. Let’s start there. Good Bible Study – Good Bible study methodology has to include awareness of context, both written and historical, as well as content, both details and flow of thought. In fact, that is a fairly good summary of good inductive Bible study. Looking at both context and content, we try to make sense of a passage. If we lose any of those four elements, we won’t understand it properly. Without historical context/setting, we will import our own culture into the meaning of the text. Without written context we will pluck passages from the larger flow of thought in their particular book. Without attention to flow of thought we will be explaining apparently random details and probably using them to springboard to our own systematic theology categories. Without attention to details we will make errors in grasping the meaning. 1. Stated intent – if the writer tells us why he is writing and what he is trying to achieve, that is great. 2. Tone of text – this is more subjective, but there will be plenty of clues in the text. Unless we ponder the tone of the text, I would argue that we are not in a position to claim understanding or to write down the main idea of the passage. Tone Matters – In any communication tone matters. Every spouse knows this. Every child knows this. Every friend knows this. And in written communication, tone is not always easy to spot. How many times have people misunderstood your emails or text (do you even know?) I can’t imagine that the Bible writers were oblivious to tone in their writing, and they probably gave attention to the tone that they intended to communicate. Before we can preach a passage effectively, we need to understand it. Before we can understand it, we need to pay attention to the tone.